This is our deluxe dolphin experience. You’ll have the chance to interact with dolphins in a way most of other dolphin experiences can't match. Kissing, hugging, and shaking hands are just a few of the many behaviors you’ll experience throughout your Dolphin Royal Swim Tour in Tortola. 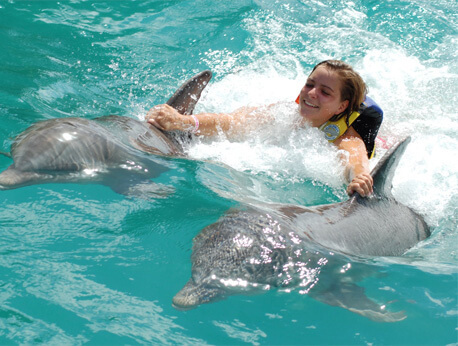 Interact with friendly dolphins in a beautiful tropical setting. What does the tour include? Aside from plenty of time in the water with dolphins, you get a boxed lunch, access to a shower and a restroom, and more attention from the dolphins than you get in any regular dolphin tour. To ensure plenty of interaction between each guest and the dolphins each Royal Swim group is limited to 10 people. Instead of simply getting in the water and petting some dolphins, you get hugs, kisses, a handshake, the famous foot push, and a tow by two dolphins. The foot push, for those who haven't seen the dolphin videos before, is where two dolphins push you up and out of the water by pushing your feet. The dorsal tow is where you get towed around holding the big dorsal fins of two dolphins. We know you'll love being in the water with these cheerful and fun marine mammals. This hour-long experience is offered Monday through Saturday on the beautiful island of Tortola. You can choose four start times to accommodate your other holiday activities. There is certainly plenty to do around Tortola. There are few things you need to know before signing up. Adults and children age 8 and older are welcome but pregnant women (over 5 months) are not able to participate in the Royal Swim experience. If you are pregnant, under five months, you will be required to sign a Responsibility Form to participate in the Royal Swim experience and be accompanied by another participating adult. Safety vests are required and will be provided. Be sure to bring a towel and some biodegradable sunscreen, to protect Tortola's delicate marine ecosystem. If you’d like to participate in other activities around Tortola be prepared with cash for cab fares, shopping, meals and so forth. Photos with the dolphins are not included in the Royal Swim. Keep in mind that a valid passport is required for travel to the British Virgin Islands, so make sure your family's passports are in order.